why is chiropractic beneficial for horses? Historically, horses spent 23 out of every 24 hours of the day grazing and wandering across grassy leafy plains. Occasionally they would exert energy to escape predators. They would then return to grazing once the danger had passed. Fast-forward through the centuries, and humans discovered that horses could be utilised for many different purposes and put them to work, commonly to be ridden or to be driven. Nowadays, horses are considered a luxury item because they have been replaced by the engine: they are no longer needed to pull the mail wagon or the gun carriage or the plough; we don’t need to ride them from Plymouth to London because we can now take the train, the plane or the car. 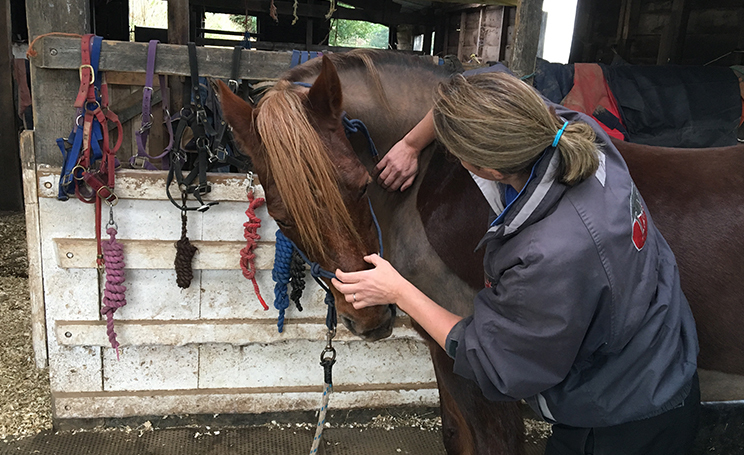 And as with the technological advances that we have made in the 20th & 21st centuries, so we have become more informed about how the way we use our horses today affect their spinal health and more importantly the health of their nervous systems; our equine friends were never created to be ridden or driven. So many of the activities – dressage, show jumping, hunting, x-country, endurance, racing – to name a few, are not the natural ally of the horse. Legally, before chiropractic treatment can be undertaken for any animal, veterinary approval must be sought and sanctioned by your vet. This can be done by the owner directly seeking permission, although I am also very happy to liaise with your vet. 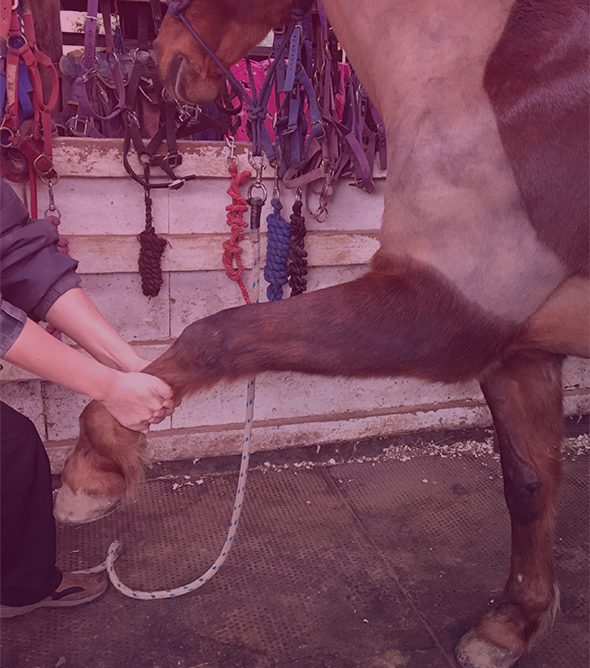 Initially the animal’s history will be taken and the owner will be asked about their equine’s activities of daily living, when the horse was last trimmed/shod, and had their teeth and saddle checked. Next the entire spine and all limbs are examined to make a working assessment. The chiropractic adjustment consists of a short, quick thrust to one specific joint at a time. Skilled spinal manipulation is not normally painful. Most animals enjoy the treatment; it is quite common for them to become increasingly relaxed and even drowsy as the treatment progresses. A research study by D Moffat et al concluded that the overall effect of the chiropractic manipulations was a less extended thoracic back, a reduced inclination of the pelvis and improvement of the symmetry of the pelvic motion pattern. With an improved functioning neuro-musculo-skeletal system comes the opportunity for the animal to optimise its natural performance levels. If the animal is biomechanically fit, and it has no other systemic diseases, with the correct training programme its performance should be enhanced. RAMP is committed to protecting the public and their animals, and promoting public confidence in the animal musculoskeletal occupation it registers. 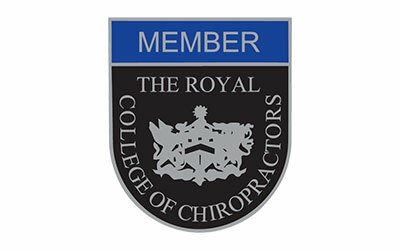 Professionals trained in Chiropractic, Osteopathic and Physiotherapy techniques are regarded at RAMP as one occupation - i.e. animal musculoskeletal practitioners. The RAMP register is intended to help veterinary surgeons and animal owners choose professionals providing chiropractic, osteopathic and physiotherapy techniques who are not regulated by the RCVS for the treatment of animals for further information click here.